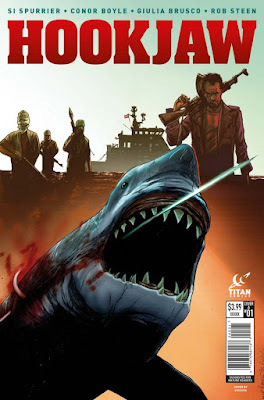 Titan Comics are thrilled to announce the release of a brand-new Hookjaw mini-series, the publisher announced at Friday's San Diego Comic-Con International Diamond Retailer presentation. Hitting stores in December 2016, the five issue mini-series is written by comics fire-cracker Si Spurrier (Cry Havoc, Weavers, Doctor Who, Numbercruncher) and illustrated by rising star Conor Boyle, with colors by Giulia Brusco and edited by legendary British comics editor and marine life expert artist, Steve White. The mini-series is set to be an intense modern iteration of the titular ocean predator, which debuted in legendary British comic (and forerunner to 2000AD) Action #1. Initially inspired by the success of the film, Jaws, Hookjaw was one of many Action strips so violent it was banned from the shelves upon release! As the series synopsis indicates, this creative team are pushing this new iteration into completely uncharted water. Off the coast of Somalia, a rag-tag group of marine scientists are studying the Virgin Brides, a pack of female great white. What secrets are laying at the bottom of the Indian Ocean? And just how will they face up to the shadowy terror of the legendary great white – HOOKJAW?! Hookjaw #1 will be on sale in comic stores and digital devices from December 2016 and is available to order from the October edition of PREVIEWS. To find out more about Titan Comics follow on Facebook, Twitter and Tumblr.